These units are typically used for the production of finished medical device packages such as thermoform trays and pharmaceutical blister packaging . PET/PVC or similar type thermoformed trays with Tyvek lid stock for the medical industry Tray sealer is made is USA..
• Seals Tyvek, foils, to plastic thermoformed trays. 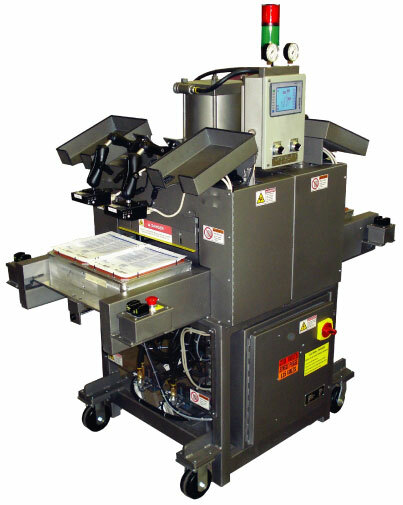 Tray sealer is designed specifically for exacting medical thermoform tray sealing and pharmaceutical blister packaging applications. Seals Tyvek lidding to thermoform trays for packaging medical devices and trays for surgical devices, blister packs for pharmaceuticals. These units are ideal for the production of finished medical trays utilizing PET, PVC, HIPS or similar type thermoformed trays with Tyvek lidstock. Can also be used for carded pill packs, clinical trial packaging, unit dose, foil lids, specialty films, Quick change tooling and operator friendly interface and controls.